If you are a year round runner and are lucky enough to live in the Colorado mountains, chances are that you will need some sort of traction during the winter months. Traction devices allow runners to tackle anything from icy roads to snowy trails during the colder months of the year. Below are a couple of the traction options that we have and why you might want to choose one over another. 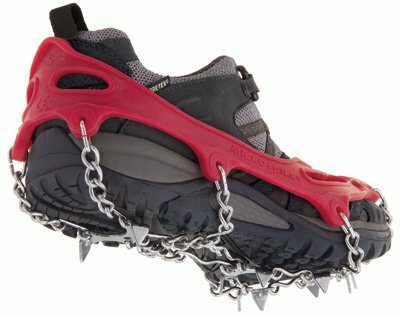 Kahtoola Microspikes – This is a personal favorite of mine, while they might be a bit heavy, they are incredibly durable and bite into ice better than anything else on the market. If you are planning on running red hill and arbaney kittle this winter and spring then this is definitely a good choice. I would not suggest running on concrete with these, carry them in your hands or your pack if you are running some pavement to get to the trailhead. YakTrax Run – An incredibly versatile option, the YakTrax Run perform well on both pavement and trail. While not as durable as the microspikes, these are significantly lighter and feature spikes on the front half of the system that dig into ice quite well. If you are looking for something that you can use on icy roads and trails then this is a great option. Ice Trekkers Diamond Grip –These Ice Trekkers fall right in-between the Kahtoolas and the YakTraxs. Made of a hardened steel alloy, this system is very durable and offers great grip on icy and snowy trails. They are also more suitable to run on concrete than the Kahtoolas as the metal teeth are not as prominent.